On October 20, 2016, the Pagosa Springs Town Council unanimously approved a motion to budget for the 2017 construction of the revised Phase 1 Urban Single Track Trail. Tony Boone LLC, who was awarded the bid, has constructed an amazing multi loop trail system behind the High School. Check out the map and go ride this super sweet trail! DUST2, TOPS and the ASD have finalized, approved and signed the Phase 1 maintenance agreement which defines the legal responsibilities of each partner. PHASE 2 Urban Single Track Trail: UPDATES! Thanks to the steadfast support from our many donors, The Archuleta County Commissioners, the Town of Pagosa Springs, we were able to construct the first part of Phase 2 of our urban single track trail system, successfully linking Yamaguchi Park to Reservoir Hill via single track and existing multi-use trail downtown and adding some super sweet new trail on Res Hill! In addition to this, a youth team from the Southwest Conservation Corps joined us for a week of much-needed trail maintenance on Phase 1! DUST2 and the Wolf Creek Wheel Club have entered into a trail project MOU to coordinate efforts to address trail building and maintenance issues collectively and advocate for improved trail experiences for mountain bicycling, and in so doing, improving the trail experience for hikers, runners and horseback riders. We will have our first joint meeting in January to discuss 2019 and 2020 trail goals. 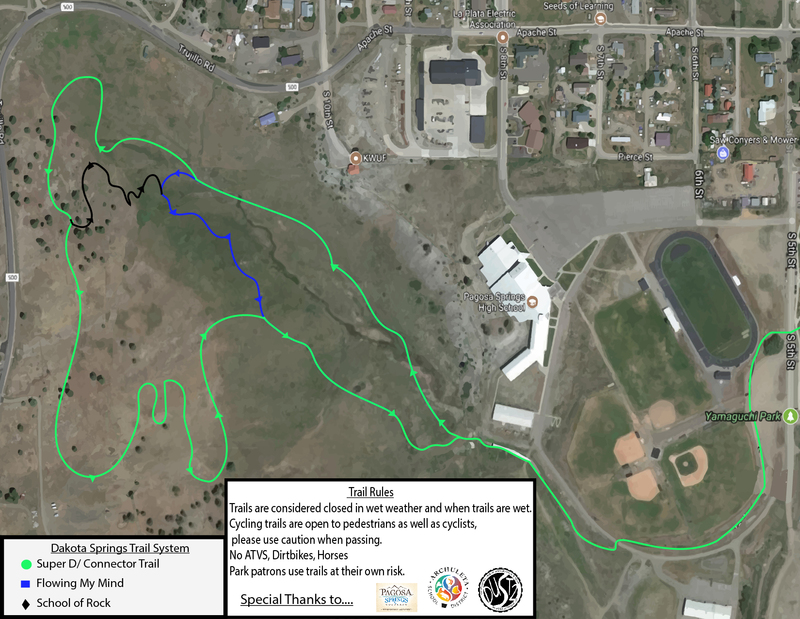 We are incredibly excited to announce that the Pagosa Springs Town Council and the Archuleta Board of County Commissioners have once again partnered with DUST2 for the completion of Phase 2b of our urban single track trail project in 2019. RFP’s will go out in January with a goal for summer construction. The Town of Pagosa Springs and DUST2 have applied for a GoCo Youth Corps grant and DUST2 applied for a NEEF capacity building grant that would allow us to hire strategic planners for the board and our youth cycling team director and coaches. We will know in December whether or not our projects have been chosen for funding.